Polymer fibers with ‘gills’ that resemble the underside of a mushroom could improve tissue engineering approaches to bone repair. Cambridge researchers have shown that particle size isn’t the only concern when it comes to the risks posed by volcanic ashes. Scientists have developed a renewable thermoplastic by replacing the styrene in acrylonitrile butadiene styrene with lignin from wood. A new hybrid material featuring a combination of rigid metal and soft, porous rubber foam can be either stiff or elastic as required. Repeatedly crumpling and wrinkling a sheet of graphene can make it water-repellent and enhance its electrochemical properties. By coating transparent elastomers with silver nanowires, scientists have developed a novel technique for quickly changing the opacity of a window. A novel ice-repellent coating made from a blend of common synthetic rubbers can cause ice to slide off surfaces. Using a 3D printer, scientists have fabricated complex 3D structures made from graphene oxide and ice. A novel electroluminescent ‘skin’ can stretch to more than six times its original size while still emitting light. A new metamaterial made from specially-patterned polymeric materials can separate and concentrate chemical compounds. Adding a tiny quantity of carbon nanotubes to metals such as aluminum can dramatically reduce the embrittlement caused by radiation. New flexible conductive tracks made from a liquid metal alloy can be stretched up to four times their original length in all directions. Using everyday materials like paper and foil, engineers have developed a low-cost sensor that can detect external stimuli. Scientists have discovered that the rearrangement of particles during deformation resembles avalanches that span the entire material. Through the EU research project HealCON, scientists are examining three different approaches to creating concrete that can repair itself. See your image on the cover of Nano Today in 2016. A novel anti-fouling coating comprises a hydrophilic polymer that forms strong covalent bonds with various materials. 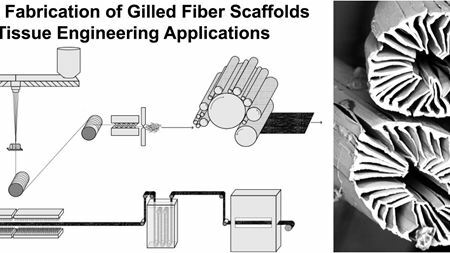 Carbon-based scaffold with hierarchical architecture could help muscle tissue regenerate after injury or disease.